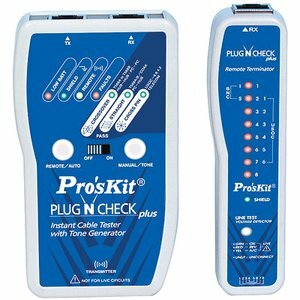 Pro'sKit MT-7055 - lan cable tester. Instantly indicates cable type (LAN/TELECOM/COAX) and tests for faults. Remote unit display actual pin configuration, detects shorts miswires, breaks, reversed, enables testing of installed cables. Checks datacom/network, voice/telecom, crossover, shielded and coax cables. Tone generator makes tracing cable with a net probe simple and fast. Suitable for residential or commercial application.